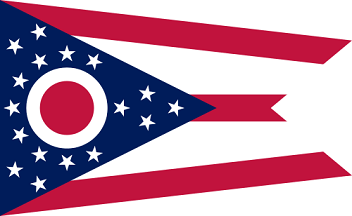 The distinctive red, white and blue pennant or swallowtail shape of the State Flag of Ohio is technically known as a burgee. Within the blue triangle are 17 stars representing the order of statehood around a large white circle with a red center. 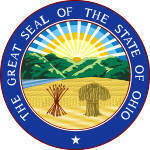 The Ohio serves as a symbol of honor, heritage and regional pride and is displayed at state buildings. There is a strict Order of Precedence for flags. State Flags are displayed in order as they entered the Union. 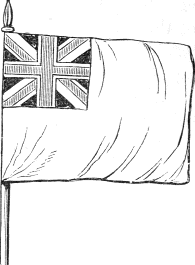 Car Flags are often displayed to represent of an individual's allegiance to their state. Ohio State car flags are used by their owners as mobile emblems of their home. Car flags are usually made from strong materials and are attached to a car via a pole and clip window attachment. What is the design of the Ohio state flag? What does the circle symbolize? The large white circle with the red center represents the first letter of the state name as well as the state’s nickname "the Buckeye State." The nickname refers to the Ohio Buckeye trees that bear a nut that resembles the eye of a deer, or buck. What does the blue triangle symbolize? What do the stripes symbolize? What do the stars symbolize? According to the laws of heraldry a star symbolizes honor, achievement and hope. The ratio is 5:8 meaning it is 5 units tall for every 8 units wide. Who designed the Ohio State Flag? What is the history of the Ohio State Flag? The state flag was officially adopted in 1902, it is the only American state flag that is not rectangular in shape. 2005: A special method for folding the emblem was created by Alex Weinstock, an Ohio Boy Scout, and signed into law later that year. "I salute the flag of the state of Ohio and pledge to the Buckeye State respect and loyalty." The salute should be made by standing at attention facing the Ohio State flag with the right hand over the heart. The Ohio flag is kept and used as required by the code specified in the constitution of the state. What is a Flag? A Flag is a piece of cloth, usually rectangular although the Ohio state flag is an exception,, of distinctive color and design, used as a symbol, standard, signal, or emblem. Official Ohio Nickname "Buckeye State"